There are a couple different reasons for this. One is that the increased temperatures result in increased vasodilation, which means that the veins expand and hold more blood, intensifying pain and pressure. Secondly, many patients are more active in the summer months, and when you spend more time on your feet, gravitational pull works against you, making it harder for blood to move up and out of your legs. To provide short-term relief, we advise patients to find regular respite in a cool, air-conditioned location, and to elevate legs to help the blood circulate out of their legs. 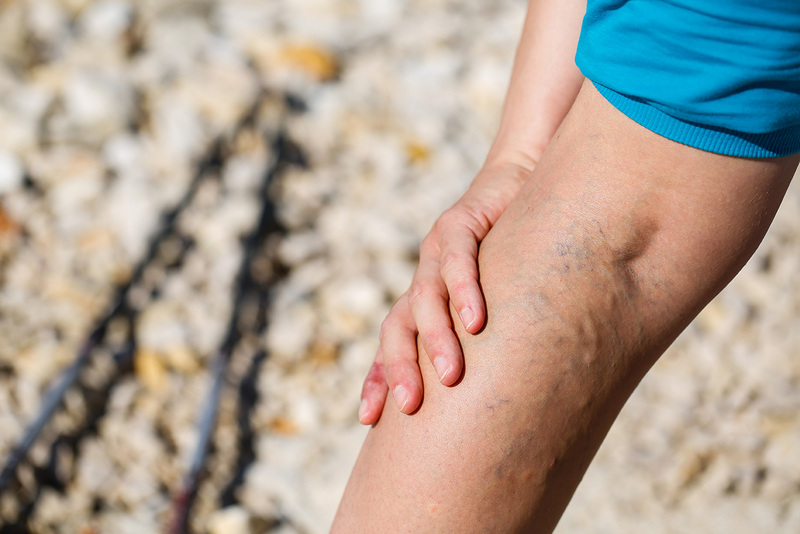 We offer a variety of treatment options for varicose veins that can eliminate the pain and swelling, and help you get back to the activities you love. Depending on the severity of your condition, the veins involved and their location, treatment may include laser ablation, phlebectomy, foam sclerotherapy, or a combination of these options. We’ll explain what will work best for your specific condition, so you know exactly what to expect. Our highly experienced team has safely performed thousands of these treatments in our office using local anesthetic to reduce discomfort. You’ll be able to return to work and resume most of your regular activities immediately following treatment. Don’t suffer through another summer with leg pain. Contact us today to schedule your appointment for an evaluation and treatment options.